James Strickland might have wanted to take some time off after he retired from his day job in 2010, but his neighbor had other ideas. “A day or two after I retired, he showed up at my house and told me it was time to get my pastures ready,” said the Chipley, Fla., producer. Strickland didn’t put up too much of a fuss. “My neighbor had about 40 cows on 28 acres. His cows were always in good shape, and it was unbelievable how little hay he fed,” he said. Impressed by those results, Strickland decided it was time to rethink how he was using his pastures. The first thing neighbor Christian Tibler did was measure Strickland’s pastures. He already had his 16 acres of pasture divided into four sections of 4 acres each, which he used to rotate his small herd. He also has a couple more acres in rough ground and swampy land. Tibler walked off half of each of those 4 acres, measuring four more minisections, or paddocks, in each half. Then he sent Strickland to buy wire and fenceposts. Today, Strickland has a herd of 20 cows on the same ground where he used to keep five. He lets them graze for a day in each strip, then he takes down the electric tape and moves them to the next paddock. They can back-graze the paddocks they’ve just moved out of to access water, minerals and liquid supplements, but just for three days. After that, he moves them to the other side of the 4-acre pasture. By the time he goes through each strip in each 4-acre pasture, it is almost a month before he comes back to the original pasture and starts the process again. During periods of lush growth, he’ll double his grazing areas. He can divide each ministrip in half and get 60 days of grazing out of each rotation. Bahiagrass is Strickland’s permanent forage. The variety he prefers is Tifton 9, one of the more productive and durable varieties. Extra production is turned into a bonus hay crop, which he has custom-cut and baled. This past summer, he reports getting 24 rolls off of 6 acres. “In the spring, I’ll probably drill some millet in and some Argentine bahiagrass, too. The Tifton 9 stays green way into the fall. I need it to go dormant so my rye can come up,” he said. Jennifer Johnson, University of Georgia (UGA) beef nutrition researcher, cautions bahia can complicate overseeding. She points out that bahiagrass sod is compact and dense, making it very competitive. When overseeding winter annuals into sod, she reports it’s typical to see greater success planting into bermudagrass sod rather than bahiagrass. As for warm-season annuals, this will be the second spring for millet in Strickland’s grazing system. He first bottom-plowed the pasture, which he uses as a sacrifice paddock when he doesn’t have growing forage. He disked it lightly and then waited a month until rain softened the soil. He planted the millet lightly with a no-till drill the first of April. Four weeks later, cattle were grazing the pasture. Strickland planted Tifleaf 3 millet at the rate of 25 pounds per acre, fertilizing it in mid-June with 200 pounds of blended fertilizer an acre. Seed and fertilizer costs combined were about $90 an acre. Winter is when Strickland’s micrograzing system really shines. “Our best pastures are in the winter, starting in February and going until mid-May,” he said. He normally no-tills ryegrass and clover into the bahia sod, but this fall, he went with Wrens Abruzzi grain rye seed and Big Boss ryegrass, hoping for even earlier grazing. He drilled 65 pounds per acre of rye seed Oct. 1. Because of the dry and warm conditions, he was reluctant to plant ryegrass at the same time. He waited until Oct. 30, then broadcast 25 pounds of ryegrass and 200 pounds of blended fertilizer per acre. Seed and fertilizer costs combined were $95 an acre. The freakishly warm fall meant the Tifton 9 bahiagrass never really went dormant and competed with the rye. It was the first week in December before Strickland could turn his cows out on it. He plans to go back to clover in this year’s mix. “I love clover. The cows do well on it. When the calves nurse, you can see the milk dripping down,” he said. He left the clover out in 2015 because he was afraid to put too much in his seed mix. “This past spring , the ryegrass and clover choked out the bahiagrass. If I could have found somebody to bale it for me, I’d have cut hay,” he said. In the fall-grazing gap, when bahia normally goes dormant and before winter annuals reach grazing height, Strickland puts cows in a 2-acre sacrifice paddock for six to eight weeks. They get good-quality hay and a free-choice high-energy liquid supplement, Mix 30, which is a blend of corn and/or soy coproducts, containing 16% protein and 10% fat. Normally, the herd will consume a roll of hay a day during this period. Besides a brief hay-feeding period, Mauldin said Strickland’s grazing system has another big bonus: His annual soil tests call for very little additional fertilizer beyond what he applies when no-tilling in his winter-grazing forages. “His system forces the cows to spread the manure across the field evenly,” said the county agent. Strickland does drag his paddocks when cows are through grazing them, a practice Mauldin points out breaks up the manure piles but doesn’t do much to spread them. Most of the benefit is from the grazing program itself. Mauldin is a fan of Strickland’s grazing system for more than the nutrient distribution. He said the producer almost has three systems in one the way he works his program. “He has mob- and strip-grazing systems within a rotational-grazing system. He gets really high forage utilization. He has been able to increase his carrying capacity to way less than an acre per animal because he uses the forage so efficiently,” he explained. The two biggest drawbacks of an intensive rotational system, Johnson explained, are the up-front cost of supplies, including a watering system, and the ongoing cost of time and labor. For Strickland, the start-up cost was around $800, which was minimized since he already had his 16-acre pasture crossfenced with gates and a lane with a water trough and mineral feeder in place. Strickland’s wife, Barbara, grew up on a family dairy and swore she wouldn’t touch his cattle. However, she’s been won over and helps James move the cows when needed. Looking back, Strickland said he’s more than glad his neighbor didn’t let him coast in retirement. Strickland said a friend who worked for the Internal Revenue Service told him years ago that he was a hobby farmer. “I wish he was still alive so I could show him different,” he said. “I sold $20,000 worth of calves last year.” He figures his annual cost per cow, including minerals, liquid feed supplement, purchased hay, seed and fertilizer, ran around $325 a cow. Lewandowski recommends offering cattle a high-magnesium mineral mix one or two weeks before spring grazing begins and throughout the spring grazing period. He says a free-choice mix should contain 12%-15% magnesium from magnesium oxide. Mix with something like molasses to encourage cattle to eat it and offer approximately 4-ounce portions per cow through spring. Have you ever had to worry about grass tetany? 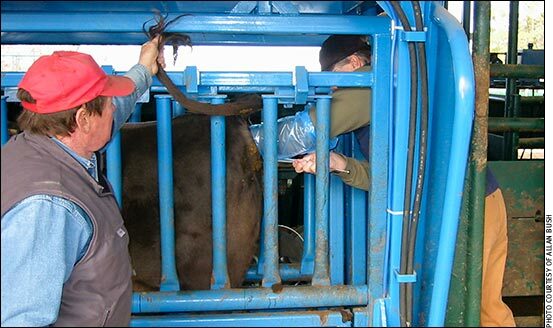 How do you prevent grass tetany in your cattle? Share your thoughts in the comments section below.